Public-private roundtable discussion at the MI Ministerial and Clean Energy Ministerial in 2016. The topic for the Mission Innovation roundtable at the MI-2 ministerial is Getting to the Future Faster: Accelerating Innovation in Clean Energy Technology through Public and Private Collaboration. Many of the most innovative technologies shaping global energy markets today can trace their origins to basic science, exploratory research, and early-stage technology development made possible by public investment. Although not well known, the results of such investment have fed an innovation pipeline that has given rise to countless advances, spurred economic growth and productivity, and transformed modern living. While publicly supported research may be a wellspring of new knowledge and discovery, it is the private sector that must identify, evaluate, and carry forward the best ideas to commercialization. Explore the importance of public investment to innovation, and the importance of innovation to the future of clean energy. Illuminate the complementary roles of public and private leadership in energy research. Highlight best practices and models of highly successful research. Seek ideas to improve public–private engagement and leverage synergies. Identify outcomes to accelerate the pace of innovation. This invitation-only small group dialogue will bring together prominent leaders from the public and private sectors so participating countries can reap the benefits of greater investment in clean energy. 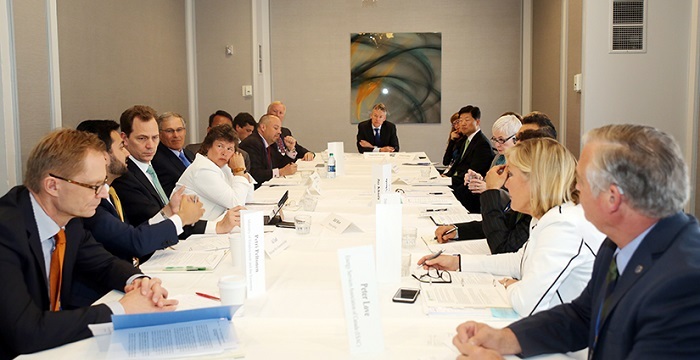 A summary of the Mission Innovation roundtable and of four Clean Energy Ministerial roundtables will be published in a report shortly after the meeting.